I do, yes. It’s very tricky because when people are scared they don’t laugh, and when there’s a camera in their face they behave differently than they do in a comedy club or in the audience on a talk show. When you’re put in that position, those in the audience become a little bit of a deer in the headlights. That’s the part [where] you have to rely on experience and the knowledge of your medium. We all know that what happens during and after the Oscars is that people will take a screengrab of somebody and build a whole story around it. I found myself in a situation at the NBA All-Star game a few weeks ago, during Fergie’s national anthem, where I suddenly was on camera and didn’t realize I was and, had I known I was on camera, I might not have had a natural reaction, and that’s in an arena with 17,000 people. Kimmel also said that he has plenty of women on his writing staff. 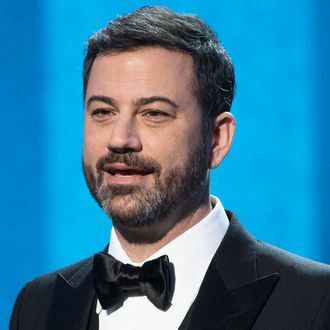 But his frenemy Matt Damon won’t be on hand to speak out about sexual misconduct or to make a joke — Kimmel confirmed to VF that Damon would be out of the country during the show.